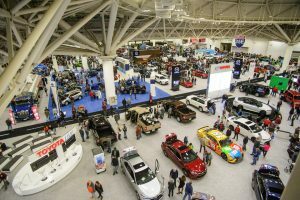 The Twin Cities Auto Show is your chance to compare more than 600 vehicles from 35 brands- foreign and domestic- without driving all over town. You will see new models in every category, from compacts and family sedans to the latest in SUVs and luxury cars. You’ll see trucks that offer better mileage, greater utility and convenience, and more luxury features than ever. You’ll hear about financing options, leasing availability, and how you can obtain your dream vehicle! You will learn about advancements in technology such as in-dash navigation, audio enhancements, communication technology, and more! And of course – instead of just dreaming about it – the Twin Cities Auto Show is where you can go behind the wheel of one of those sleek, shiny new sports cars. If you are in the market for a new car or truck – or just thinking about it – this is where you’ll find your next vehicle. If you are an auto enthusiast, this is the perfect opportunity for you to see in-person the vehicles that you’ve heard and read about. If you’re just looking for a fun and exciting event, this is guaranteed to be a memorable time and perhaps the beginning of your automotive story!